The best chefs transform simple ingredients into stunning culinary creations; the secret ingredient is always innovation. We understand that you may not want the Boxman Studios team anywhere near a skillet, but we take the same innovative approach to designing and building your structure. Here at Boxman, a simple steel box with a generous splash of innovation becomes a fully functional restaurant. But before it does, what do you need to know about the regulations you’ll encounter? A simple setup: e.g. popcorn machine, hotdog machine, and cooler for drinks. This is an ideal design for festivals, concerts, games, and other events. A commissary. Cooking and prep is done at a secondary location, and the mobile location warms and serves. An established restaurant, for instance, can start a satellite location to appeal to a completely different demographic. Full restaurant. This is a fully functional, stand-alone eatery where everything is done onsite. Chopping, dicing, cooking, grilling: you can do anything from kabobs to lobster bisque. Deciding on your definition of “kitchen” is critical. It will help you accomplish your goals and objectives, as well as influence the design and compliance process. Let’s go back to our popcorn and hotdog restaurant. In this case, you may not be required to have any type of sink. If you’re doing prep work offsite, you don’t need a sink for washing dishes, but you do need one for hand washing. For a full kitchen, you need a floor sink, hand-washing sink, and a three-bay sink (soap, rinse, and sanitize). And the sinks have to comply with size requirements. Saying “I need a sink in a container” is easy—and Boxman Studios can easily install them—but it does raise other considerations, such as water sources. This is what we do: we handle the small details so you end up with the functional space you need. A restaurant is a restaurant, whether it’s made of bricks and mortar, lumber and nails, or shipping containers and solder. Certain regulations still apply. Regulations change from municipality to municipality. One city may require that you use copper in your plumbing; the next city wants you to use PVC. One locale may require you to have a two-inch drain, while the next wants a 2.5-inch drain. You have to meet the requirements of each municipality in which you want to do business. Regulatory authorities don’t have rules concerning containers specifically. What “class” does your restaurant fall into? They have to figure that out so they can determine which codes apply to your eatery. One of the factors in this decision is your intended length of stay. If you’re staying for 30 days, you may be a “temporary” establishment. On Day 31, you may become “permanent,” and so this classification can change which hoops you have to jump through earlier on in the process. If you have stairs, you need a ramp with a slope of 12 ° or less. It has to measure at least 36 inches wide and have a minimum landing length of 60 inches. If it’s longer than six feet, you need a handrail, measuring 34 to 38 inches in height. We’re not even inside yet. Entrances have to measure 32 inches wide. If you have fixed seats, you need an aisle at least 36 inches wide. The counters and tabletops need to be 28 to 34 inches in height. The requirements can feel endless, but Boxman Studios has extensive experience in handling ADA compliance and can help ensure your restaurant not only serves the best food in town but is completely accessible. And fully compliant. 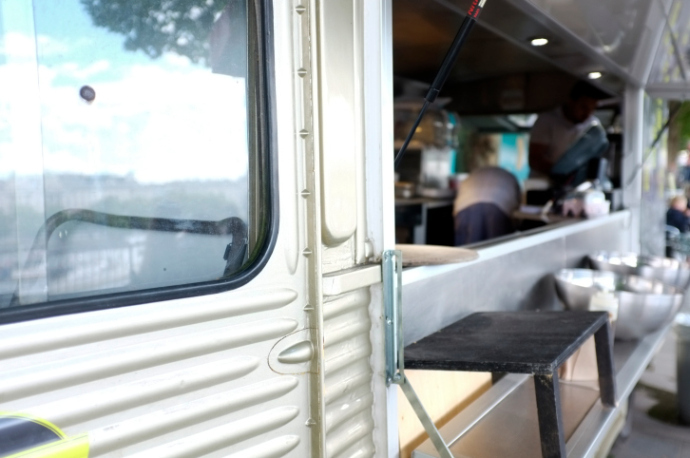 Even experienced restaurateurs face unfamiliar territory with mobile restaurants. Working with an experienced architect/design company can help pave the way to success. You don’t want to end up with a beautiful, expensive paperweight. A dining room full of happy patrons sounds much better. Find out if Shipping Containers are right for your restaurant project with our complete guide including regulations, pricing, and how to get a return on your investment.